After over 30 years and billions of dollars (and euros, pounds, and yuans) of restoring wetlands globally, and especially in the USA, the time has come to evaluate the results, and particularly to find out how wetlands are responding to our efforts. The results found in this paper show that once the hydrology is restored the effect of revegetating is unclear, and in some instances is even negative. What this could mean is that wetlands need us to restore them in the best possible way with our present knowledge of their hydrological dynamics, that is, their connection with the water-table, the tides, or the stream flow, or the basin that allows the water to stay for longer or shorter periods. But beyond that, it seems that wetlands will follow their own way regardless of what we want them to do. Planting, with all the money that this means, will not necessarily involve a better performance of a restored wetland. But why is that? 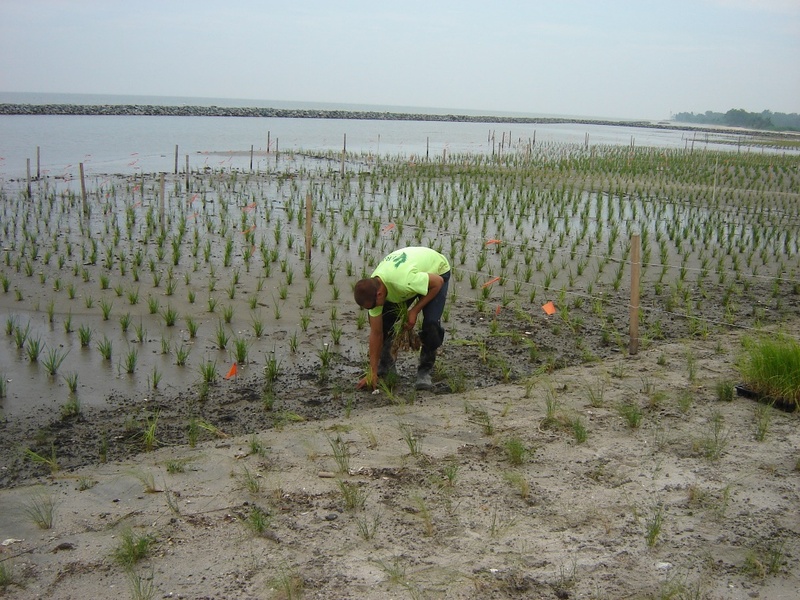 Revegetation of coastal wetlands with Spartina sp. in eastern USA (Photo credit: Ecosystem Restoration and Management, Inc.). There could be several reasons for this to happen. But the main one is that we think we know what the wetland plants need, but actually we don’t. Thus, we plant certain plants in conditions that do not allow them to prosper, whether it is because they cannot benefit from the resources available in that area of the restored wetland, because they find toxic conditions and die, or because they are outcompeted by pioneer species more efficient in using the available resources. Put simply, do what you want, but they’ll do what they need or can. Luckily, the science of restoration is making important progress in understanding what plant communities need from the very beginning to make sure we create the best conditions for them, but the results are still at very early stages, and sometimes are only useful locally. Then, what can we do? It is a bad idea to assume defeat in all cases and let the plants go their own way. Although this may be the best option in some cases, it is a much better idea to carry out your own trials. As many of you will know, restoration is not about “restore and go”. It could be more efficient to save more money at first, investing small fractions of it in finding what the best conditions for the plants are, and also what the best plants for those conditions are, and then spend the bulk of the money. This may take several years; do not expect to see the light in two years; I would say never less than three to five, but this is widely open to discussion. I know that this will sound unfeasible to those who need to spend that pocket of money because otherwise it will be lost, but restoring in the traditional “restore and go” way, your money will most likely be lost for everyone (except for the contractor). 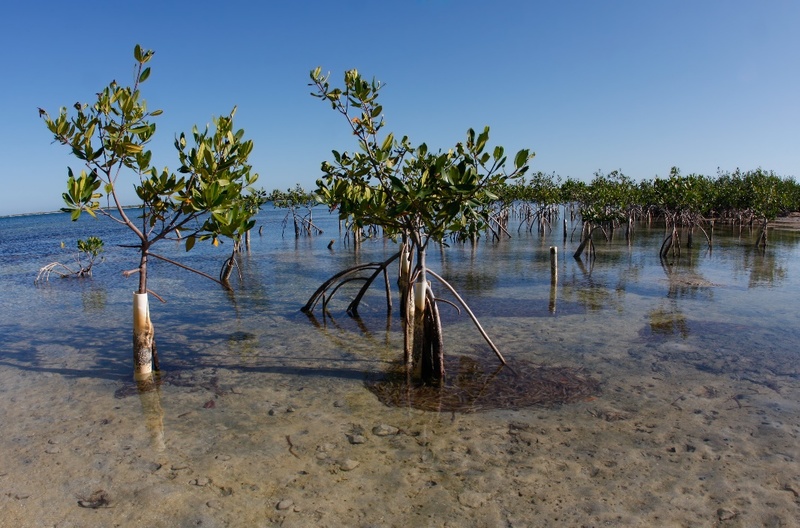 Mangrove restoration in Puerto Rico in a Bahia open to the sea (Photo credit: Bill Hubick). You may end up finding that there is no clear combination of conditions and species that can be effectively used in your wetland. In these cases, you may need to focus on other actions, like preventing invasions or control pollutants, while the wetland finds its way. On the other side, there may be cases where you do need to do something quickly, otherwise nothing will happen, like in the case of mangroves affected by high wave energy. In any event, the point is not about expecting a wetland to do what you want it to do because you have your ecosystem services or another objective to be delivered, it is about getting to a common ground with the wetland and being realistic in what a wetland is and can do. Otherwise you most likely will be an ecosystem designer, or a landscape architect (like my brother), but not a restorationist. Next Next post: The stage is set: Will expanding development be a sea change? Restoration, unlike landscaping, should rely on natural processes to take the lead as soon as possible, after the initial interventions are completed. The restoration of geophysical and hydrologic conditions should be our first goal, followed by controlling invasions and trials of biotic interventions.